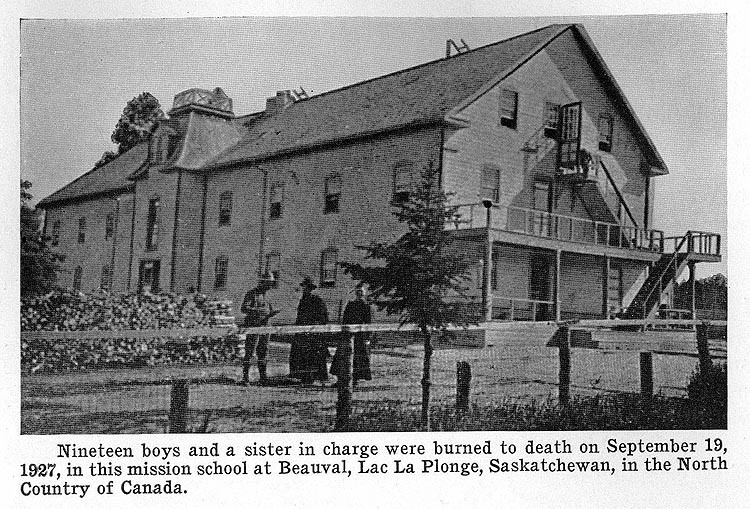 A fire in an Indian Mission School at Beauval, Lac La Plonge, Saskatchewan, in the North Country of Canada, took a toll of twenty lives on the night of September 19, 1927. Nineteen boys, between the ages of seven and fourteen, and the nun in charge of them were burned to death. Thirty-six girls and eight nuns left the building in safety. The building was a three-story frame structure, about 120 feet long. There were five stairways: two on the outside of the building at either end, one in the center, and one at either end inside of the building. The school was equipped with chemical extinguishers. The sleeping quarters of the boys and the nun in charge were at the south end of the third floor. The girls and other nuns occupied the second floor and the north end of the third. At the start the fire was mostly in the center of the building. Its cause is not known. It is supposed that it started from the furnace or from a galvanized iron chimney of which one of the joints may have been loose and allowed the fire to reach the wooden walls. The Sister Superior was awakened by a crashing noise. She saw the light reflected by the fire and rang the bell that served as a fire alarm. Due to their training there was no panic among the girls. They rolled their clothes in blankets. The older girls waked the little ones, according to their drill system, rolled their clothes for them and guided them out of the dormitories. They left the building by an outside stairway. Because of the dense smoke, the nun in charge could not be sure that all had left. Their safety was attributable only to their previous training. Meanwhile the Sister Superior was going through the corridors on the second floor waking the other nuns. She saw the fire in the center of the building, which blocked all exit from the main stairway, and led the way out by a second floor exit to an outside stairway. The Sister Superior ran up the outside stairway to the third floor. Breaking a window, she cried a warning to the boys’ dormitory. These children, being younger than the girls, were not so well trained in fire drill. If they had been they might have left their dormitory by way of the outside stairway on the south end simultaneously with the nuns. As it was, by the time they had collected their bearings, they found this exit completely cut off by the flames that shot up past it from the open door below. The boys and the nun with them found themselves surrounded by flames. They blindly rushed for their accustomed exit, which led down to the second floor, in the center of the building. This was a very narrow staircase with room for only one person to pass at a time and having a door at the foot. The bodies of the boys and the nun were found in the ruins of the basement at a spot corresponding with the location of this staircase. The time consumed thus far since the first alarm was about four minutes. One of the priests from a near-by cottage emptied several chemical extinguishers on the flames at the outside door through which he hoped the boys would escape. Within five minutes the frame structure was in flames from end to end. Attempts were made to reach the boys with ladders, but these caught fire as they were placed against the building. 1. "Beauval Mission School, Sept. 19, 1927", 1000 School Fires, A record of 1000 school fires and major school disasters, October, 1939, Boston, Mass., page 11-13.